We live in a nation that is unique in the tremendous importance it places on free speech. Not only does the Constitution forbid official censorship, but it invests our government with the extraordinary responsibility of ensuring that all Americans can be heard. In this context, the ability of the citizenry to participate in elections and have their votes accurately cast and counted is paramount. The 2016 Presidential election was a watershed moment in the history of elections. The election exposed new technical and operational challenges, showed us that citizens must become more discerning consumers of information, and demonstrated that our leaders must speak candidly and apolitically about threats to our election systems. 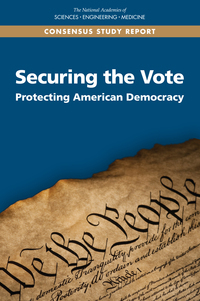 Our recent report, Securing the Vote: Protecting American Democracy, examines the challenges arising out of the 2016 federal election, assesses current technology and standards for voting, and recommends steps that the federal government, state and local governments, election administrators, and vendors of voting technology should take to improve the security of election infrastructure. In doing so, the report provides a vision of voting that is more secure, accessible, reliable, and verifiable. This entry was posted in General Topics and tagged 2016 election, democracy, election, vote, voting on September 20, 2018 by Hannah Kenton.